Need a little color inspiration? Let our interior design partners at Jasmin Reese Interiors tell you about May's color of the month: green! Here in Chicago, the spring comes pretty late in the year. We’re just starting to see a riot of flowers budding on the trees in Lincoln Park, and so many lovely shades springing up all over the city! For us, green represents renewal and revitalization, and reminds us to appreciate and be inspired by nature. To highlight the visual appeal of this undeniably fresh color, we have selected some of the best uses for green we’ve seen in the design world recently. Green is a beautiful and versatile choice for the walls in your home. Bolder than a typical neutral tone, but always classic and crisp, green is often a fabulous choice for interiors. We adore the way this jungle-esque large-print banana leaf wallpaper combines with an elegant, muted rose upholstered dining set to deliver just the right amount of zing to the room. We just installed this delightful green zebra-striped wallpaper by Schumacher in a sassy Lincoln Park powder room, and we’re so happy with the results! This addition of a rich green accent wall gives this room an air of sleek sophistication, and we love how it draws out the bright hue of the palm plant. Right now, our favorite green paint picks are Benjamin Moore – Seaweed and Sherwin Williams – Cilantro. Don’t forget — effective lighting for your rooms is essential to help the colors shine! Naturally, green evokes plants and the organic world. 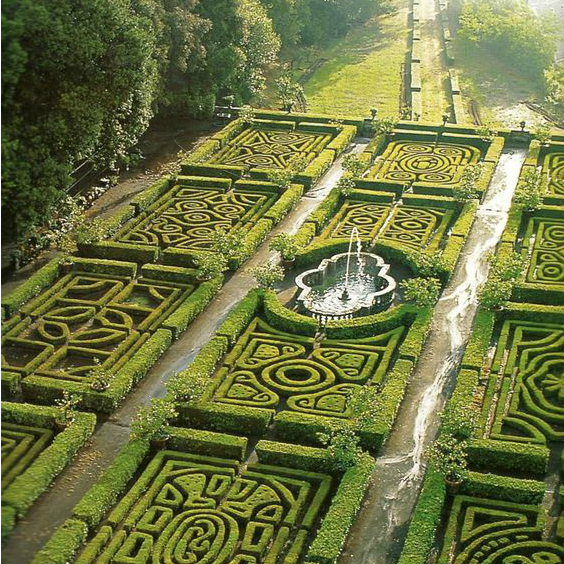 We’d like to leave you with this image of maze gardens at Ruspoli Castle in Northern Lazio, Italy for inspiration. Think you'd like to liven up your home or office with some naturally inspired hues? Call us for a free color consultation with Jasmin.